I had a teacher in primary school that used to bring her own chalk to class. It was the dust-free type which was apparently better for your sinuses. I didn’t really understand the reasoning behind this as there still lingered a cloud of dust from previous lessons all over the classroom. I guess, though, this was a precursor to the green revolution of the present time. Switching a single light off won’t save the planet but by doing so, you do contribute to the collective effort. The fact that she used dust-free chalk meant she minimised the amount of chalk dust she was exposed to even though it didn’t completely eradicate it. Chalkboard in the Maboneng Precinct doesn’t really use the dust-free type of chalk. But I don’t think that is necessary. actually does use the dust-free type. I guess my teacher had the right idea all those years ago. Chalkboard is one of the primary components of the inner city rejuvenation of the Maboneng Precinct towards the east of the city. 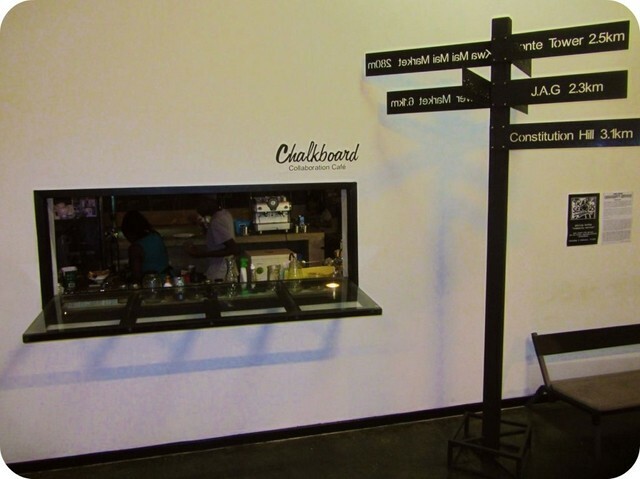 Situated just a little further along Commissioner Street than the awesome Collectors Treasury, Chalkboard is the central meeting point in Maboneng if you’re planning a night (or day) out in the precinct. Maboneng is the new face of Jozi and I have been fighting with myself to not write about the precinct. I love the area – it is one of my favourite spots in Jozi and I make a concerted effort to always take any visitor here. The vibe is beautiful with the industrial stalwarts from yesteryear existing beside the new artistic culture that is slowly infiltrating the city. It has brought a sense of hope that art is viable in this capitalistic monolith of a city. But this is why I’ve not written about it. It is still is an infant that requires nurturing. Every visit to Fox Street seems ever-so-slightly unfulfilled. It holds a promise of so much more. I always feel that something is not there, like the area is incomplete. It could be a village where the true spirit of Jozi can shine but it is just not there yet. It still needs to be polished like a rough diamond. Sadly, most development funds are dished out privately 30km north and by government 30km to the west. Those investments still make more sense. But those only help the monolith grow. It’s a dilemma. I guess we just need to give the place time to truly blossom. That being said, this should not be a reason for you not to visit. Anyway, seeing that this precinct is in the heart of the “unsafe” city, one really important thing to remember is that the precinct is bordered by the Diamond Exchange (Jewel City) which is probably the most secure and heavily guarded locations in South Africa. 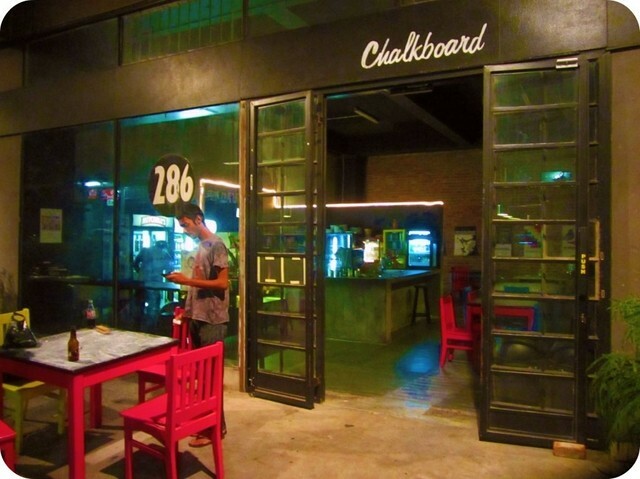 Chalkboard Collaboration Cafe is a quaint, roadside eatery perched between the Pata Pata Restaurant and The Bioscope. It’s housed in the same building as Main Street Life which incorporates the 12 Decades Hotel. The building is pretty cool. Make some friends with the locals and have them give you a tour. There also are several other buildings around and depending when you go there, these may have interesting shops or pop-up stores to visit or even have some offices you may want to rent. Chalkboard itself has a minimal, industrial feel to it with plain cement blocks complemented by vast black chalkboards. It has the feel of the oppressive Jozi during apartheid but not such that any modern day, born-frees feel intimidated. 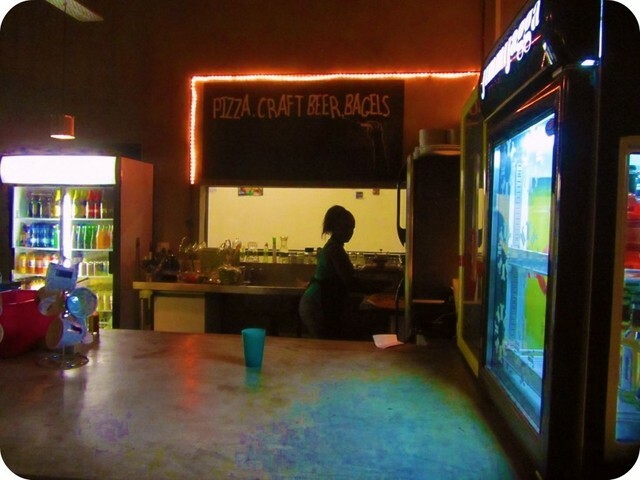 They specialise in pizza, craft beer and bagels. They have several types of craft beer available with new ones being added at will. Presently, they stock Brewers & Union, Nottingham Road Brewery, Darling Brewery and Mitchells from Knysna. The latter is now available on tap which is pretty damn awesome. They do offer the tried and tested SAB and Nambrew staples if you’re just plain boring. The COOLEST thing about the craft beer is that it’s available in one litre resealable bottles. I don’t think you have the ability to fathom the awesomeness of this. The food is simple yet great. The pizza choice seems limited and you do need to build your own bagel (not literally although I’m sure they will give you the ingredients to build it yourself if you so please) but it’s sufficient. The limitation of the menu means it has been perfected and tastes just plain amazing. 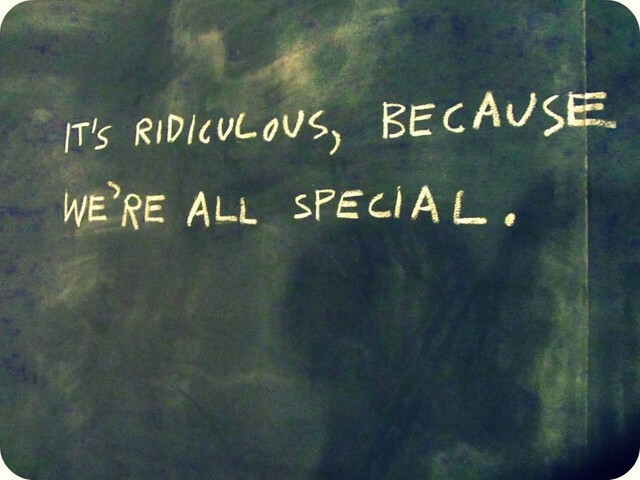 The décor is what makes Chalkboard seriously awesome. 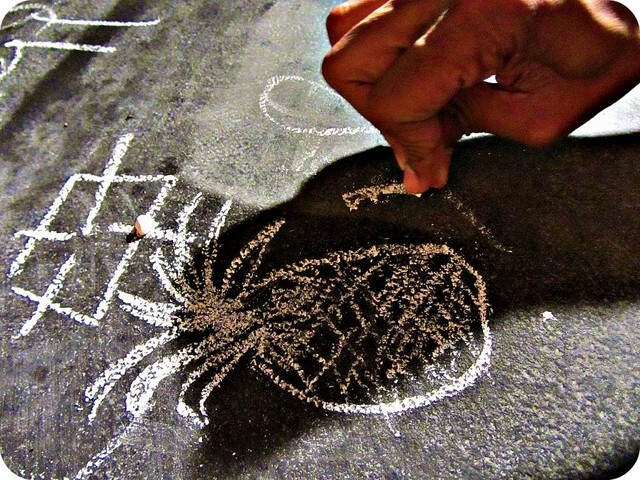 The walls and all the tables are blackboards and there is an abundance of chalk available for you to customise the décor. As cool as this is, it is also a daunting task as you are responsible for making the venue yours and having others walk by and appreciate your musings. Unless you are a creative, you are bound to pick up the piece of chalk with enormous hopes but as you extend your arm to the board, you will stutter as you realise you have no idea what to draw. To salvage something, you end up writing out a phrase or your name to disguise your lack of creativity. This outing to Chalkboard had an ulterior motive. 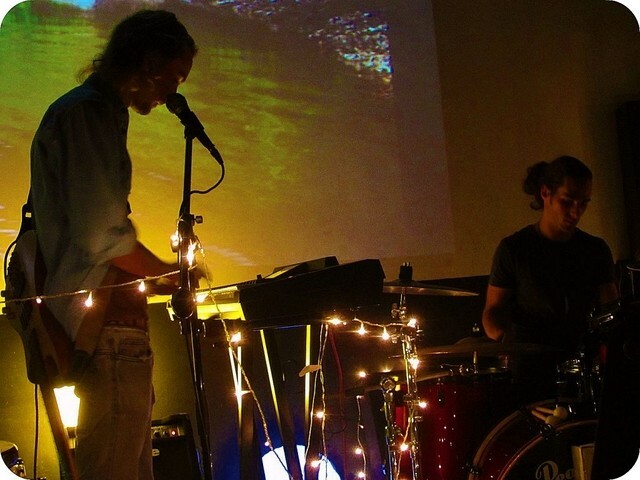 One of my favourite new bands of the last few years was doing a gig inside The Bioscope. As the name suggests, it is a cinema. For all the kids out there, go speak to your parents or grandparents and ask them to explain the term. It is the local home of independent and obscure cinema and now it’s a live music venue with a difference. The cinema prides itself on broadcasting what you probably will only be able to source from some left-of-centre site tucked away in the outer rim of the internet. The Bioscope has done a damn good job at presenting material that the normal South African would not see. They also show contemporary classics and have homages to legendary actors. In February, they showcased John Cusack and showed one of my all-time favourite (books,) “High Fidelity.” Probably the coolest concept is their Noodle Box Cinema night where you can eat noodles whilst watching a kung-fu classic. Best of all, you can bring in your one litre beer that you purchased at Chalkboard! The band, Holiday Murray, is just plain amazing. I was handed a pre-release demo of their debut album (yes, I am hipster like that) and have been in love with them ever since. They have definite roots in Simon and Garfunkel as well as Crosby, Stills and Nash. Their sound teases of the Fleet Foxes but does not have the ostentatious outlook that they present. Yes, I called the Fleet Foxes ostentatious although you should listen to Holiday Murray to understand. They have this unbelievable folk vibe that grabs and holds you. It takes you on a journey far beyond the maturity of the band. 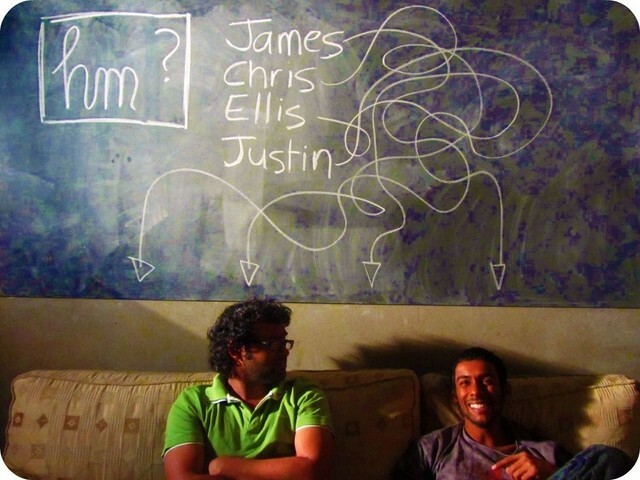 The band has had a song playlisted on 5fm so you might have actually heard (and loved) them. The show was a unique intermingling of visuals, light and sound in this cosy, intimate environment. Their set was a journey taking them chronologically through their discography culminating in them playing unreleased material from their forthcoming album. 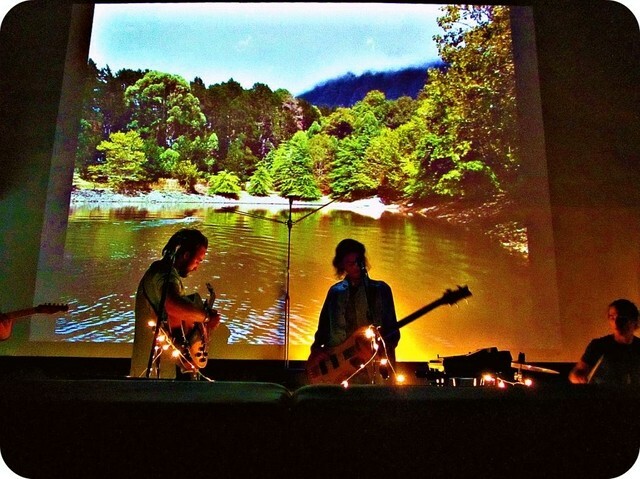 They also shared their travels to Malawi to play a festival there earlier this year. This was a risky voyage which taught the band oh so much. It was stunning. It was magical. It was the best gig I have been to in a VERY long time. When I exited the theatre, I felt as if I was part of something beautiful. 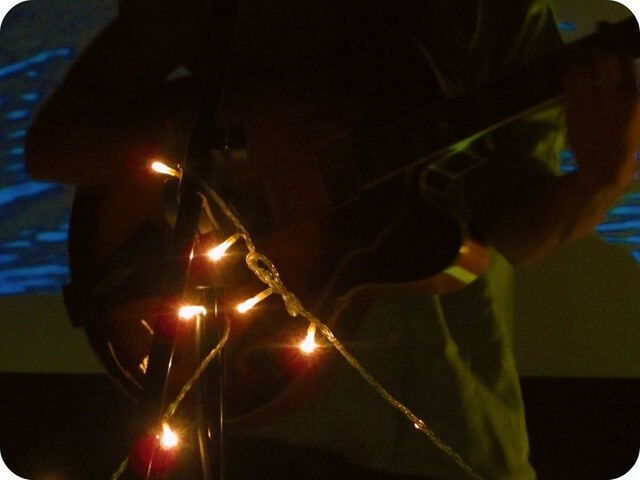 The concept has caught on and many artists are now playing at The Bioscope at their Band Stand event. Just go – trust me. 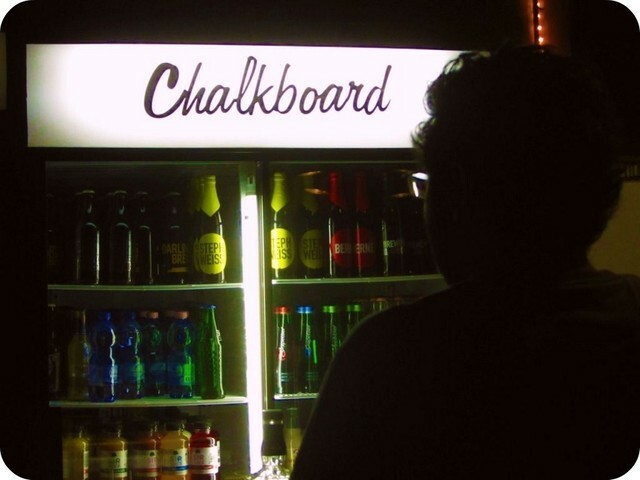 When to go: Chalkboard is open every day so go by for a drink or snack whilst exploring the city. The Bioscope is open on most evenings of the week. Check out their schedule on their site to see if they’re showing any movie of interest. The special events are usually sold out so book early otherwise, just pop by around 19h00 and buy tickets at Chalkboard. How to get there: Maboneng is problematic to reach especially at night. I have been unfortunate enough to have broken down at night en route there in a rather unsavoury area. Check out their directions and if possible, use the route from the M2. Do not follow your GPS blindly. Look at the route, maybe check it out on Google Maps and then drive there. Unfortunately, the urban renewal does not apply to all access roads to these districts. Cost: Prices at The Bioscope vary from around R40 to about R100. It is an experience and the movies shown are not normally found in your local Nu Metro or Ster Kinekor. It’s the same with the craft beers at Chalkboard which are priced slightly more than the SAB equivalents. The taste of most beers does warrant the price although drinking a few will leave your wallet crying. Also, go get the Holiday Murray CD!